PARIS – The former intelligence chief for Libya’s National Transitional Council (NTC) has alleged that a French secret agent working with the complicity of Syrian President Bashar al-Assad killed the Libyan leader, Colonel Gaddafi. NTC spy chief Rami el-Obeidi told Paris-based news website Mediapart on Tuesday that “French agents directly executed Gaddafi” on October 20 2011, in an affair that implicates both former French President Nicolas Sarkozy and the now embattled Syrian leader Assad. In October 2011, the press reported that the Libyan dictator was beaten and killed by rebel forces after being found hiding in a drainpipe. However, longstanding rumors that foreign agents orchestrated the killing has gained credence in recent days after an interview last week on Egypt’s Dream TV with Mahmoud Jibril, who’d served as interim Libyan Prime Minister following Gaddafi’s death. “It was a foreign agent who infiltrated the revolutionary forces and killed Gaddafi,” Jibril told the Cairo-based TV station. Italian daily Il Corriere della Sera followed that up with an accusation by Western diplomatic sources in Tripoli that said it was “almost certainly French” secret service agents involved in Gaddafi’s death. At the time, Gaddafi was threatening to reveal details that he helped finance Nicolas Sarkozy’s 2007 electoral campaign. Rami el-Obeidi suggests to Mediapart that the French government under Sarkozy wanted to silence Gaddafi. He suggests that French spies were able to set a trap for Gaddafi by obtaining the leader’s phone number from the Syrian government, enabling them to pinpoint his location when Gaddafi made a call. This would explain how revolutionary forces were able to find the former leader, who was hiding in a drainpipe in the Libyan town of Sirte. El-Obedi also suggests that Bashar al-Assad, attempting to divert attention away from the conflict in Syria, gave French forces information of Gaddafi’s whereabouts in exchange for France easing pressure on Damascus. National Transitional Council (NTC) has declared the liberation of Libya, eight-months after the uprising against Muammar Gaddafi’s 42-year rule began. 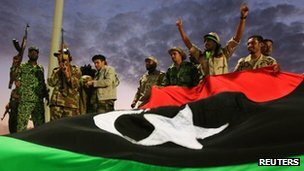 Thousands of people in Kish Square in Benghazi, Libya’s second city, sang the national anthem and waved flags, both of which date back to the monarchy which Gaddafi overthrew in a 1969 coup. Mustafa Abdel Jalil, the leader of the NTC, kneeled in prayer after taking the stand in the celebration on Sunday and promised to uphold Islamic law. “We as a Muslim nation have taken Islamic sharia as the source of legislation, therefore any law that contradicts the principles of Islam is legally nullified,” Jalil told the crowd. The NTC leader thanked the Arab League, the United Nations, and the European Union for supporting the uprising which ended with Gaddafi’s death on Thursday. “All the martyrs, the civilians and the army had waited for this moment. But now they are in the best of places … eternal heaven,” he said, shaking hands with supporters. “The revolution began as a peaceful one. But it was faced with violence,” he told the tens of thousands of Libyans gathered in the city, where fighting against Gaddafi erupted in February. Abdul Hafiz Ghoga, the council’s vice-chairman, said at the ceremony that Libya would uphold all international agreements and treaties. “The Libyan people, as they establish a state of law, firstly, assure the world of their respect for all Libya’s signed agreements according to international standards,” Ghoga said. US President Barack Obama congratulated the people of Libya with what he called a “historic declaration of liberation”. “After four decades of brutal dictatorship and eight months of deadly conflict, the Libyan people can now celebrate their freedom and the beginning of a new era of promise,” a statement from Obama said. The NTC has said it will now embark on the process of building a democracy and hold the country’s first free elections next year. Libya’s new leaders have a “very limited opportunity” to put aside their differences, said Mahmoud Jibril, the country’s interim prime minister, as he announced he was stepping down on Saturday. Jibril said that progress in Libya would require stronger resolution from the NTC’s leaders as well as from the six million citizens of the country. “First,” he said, “What kind of resolve the NTC will show in the next few days? Jibril said that the first elections for a national constituent assembly would take place “within a period of eight months”. The NTC’s forces were largely comprised of loosely organised local armed groups that sprang up in towns where citizens wished to see Gaddafi’s rule ended. These groups remain armed, and it is unclear what role they expect to play going forward following Abdel Jalil’s announcement. The armed groups in Benghazi and Misrata were particularly influential, with the latter playing a key role in taking Tripoli, the capital, and in capturing Gaddafi from a drainage pipe outside Sirte, his last stronghold. He was later killed before he could be transferred into NTC custody. The fighters brought Gaddafi’s body back to Misrata, where it has been on display for two days in a cold storage container for Libyans to see. Concerns regarding the manner of Gaddafi’s death remain unaddressed, meanwhile, Navi Pillay, the United Nations Human Rights Commissioner, has called for an investigation into the killing, which appeared to be a summary execution. The questions are not limited to international observers. On Saturday, Waheed Burshan, a member of the NTC, told Al Jazeera that Gaddafi had clearly been captured alive and that there should be an investigation into how he was killed. “We found that he was alive and then he was dead. And as far as we can tell there was no fight,” he said. Burshan’s comments contradicted Prime Minister Jibril’s account that Gaddafi was killed in crossfire. An Indian newspaper vendor holds papers carrying the news of the death of former Libyan leader Moamer Kadhafi on its front page at a distribution centre in Mumbai on October 21, 2011. AS THE rebel insurgency flowed and ebbed across Libya this year, it passed through most of the staging posts in Muammar Qaddafi’s life. Sirte, where he was born in a Bedouin tent in the sand-wastes and died amid the crackle of sniper fire; Misrata, where he went to a private tutor to learn history; Benghazi, where at military college he began to plot revolution; and Tripoli, where in the sprawling half-bombed barracks at Bab el-Aziziya he pitched his tent again, the Brother-Leader, insisting he would never leave until he had fired the last bullet he possessed. When death overtook him, he had ruled Libya for 42 years. The handsome, magnetic army captain who had overthrown King Idris in 1969 had become a robed buffoon, with a surgically smoothed face, a mop of dyed black hair and, until she scuttled home, a blonde Ukrainian nurse on his arm. Yet he was no less cunning. Behind the designer shades his eyes were those of a fox. By sheer imposition of the cult of himself, he had held his tribally fractious country together. He ruled unsparingly. In his Libya, dissent was punishable by death. A private press was forbidden, and political parties banned. Several dozen deaths a year of political opponents were attributed to his secret police, acting on tip-offs from the surveillance committees to which around 10% of Libyans belonged. In Abu Salim prison, on one night in 1996, 1,200 political prisoners died. If his enemies fled abroad, his hired assassins found these “scum” and killed them. The colonel’s writ, as recorded in his “Green Book” of rambling political philosophy, replaced the rule of law. His rule had begun better. Like Venezuela’s Hugo Chávez, a rare ally, he came to power determined to secure oil revenues for his people rather than for foreign corporations. Having renegotiated the oil contracts, he redistributed wealth and saw Libya grow rich—though no one grew rich faster than his own clan, with billions invested abroad. Oil gave him power far beyond the confines of his dilapidated state. He began to see himself as the leader of the Third World, the voice of the world’s poor, the King of Africa (when, in 2009, he chaired the Organisation of African Unity) and the patron of world revolution. He invited to Libya for military training such bloodstained luminaries as Liberia’s Charles Taylor and Sierra Leone’s rebel leader, Foday Sankoh. He gave money to Colombia’s FARC and the IRA, and tried to radicalise even the Maoris of New Zealand. Wherever anti-Western or anti-parliamentary feelings stirred, he was there, sowing trouble; for as he said in the “Green Book”, the only true democracy was the direct, even violent, expression of the will of the people—except in Libya. Around this figure the West, for four decades, prevaricated. The young colonel’s “Third Mystery of Socialism”, a middle way between capitalism and communism which, in his words, solved all the contradictions of either system, seemed unthreatening enough. His people’s communes were blatantly powerless, his own “brotherly” power absolute, but then absolutism was common enough in oil-producing states. He was not a Marxist, at least: Egypt’s nationalist hero, Gamal Abdel Nasser, was his model, rather than Lenin. And he had oil. Eventually tolerance snapped. In the 1980s, as Colonel Qaddafi shopped round the Far East for nuclear bombs, sponsored terror groups, invaded Chad in the cause of a “Greater Libya” and sent agents to blow up a Pan Am airliner over Lockerbie in Scotland, he became a pariah: Ronald Reagan’s “mad dog”, to be bombed until he whimpered. But by the new century he was ingratiating himself. He said the right things about al-Qaeda; offered his nuclear programme for inspection, and in 2003 abandoned it; paid compensation for Lockerbie; and, apparently chastened by his own military incompetence, seemed to have forgotten his windy pan-Arab and pan-Islamist dreams. In a world suddenly teeming with dangerous Islamists, he was now far from the worst. At the G8 in 2009 he shook hands with Barack Obama. The same year he was allowed to speak for more than an hour at the UN, repaying its tolerance by tearing from the UN Charter the pages that talked about democracy. He never forgot his origins among the desert wanderers and cattlemen. 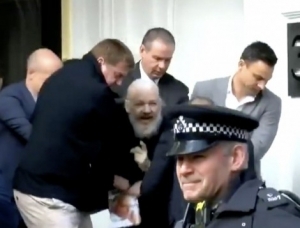 Despite the gilded mermaids and white pianos of his ludicrous quarters in Tripoli, he preferred to live in a tent, and always travelled abroad with one. When not in uniform, he wore flowing robes. His grandest project, the Great Man-Made River, brought water from southern aquifers to the northern cities. Precious green was his colour, in flags, Book and billboards. His socialism, at root, was based in desert customs of shared property and grazing land. His deep devotion to the army was the gratitude of a poor boy who had used it as a ladder to higher social rank and more grandiose ambitions. Almost to the last, too, he tried to pose as one of his people. When protesters first erupted on the streets of Tripoli this year, he offered to protest along with them. Surely, after years of venomous pabulum from his “Green Book”, they would have learned to think as he did. But they were beginning to dare to think differently—about Libya, and about him. The dictator’s wife, daughters and several of his sons are reportedly in Algeria. Just one of Moammar Gadhafi’s eight children is still unaccounted for following the Libyan dictator’s death last week, and although he is currently wanted by the International Criminal Court, Libya’s former heir apparent is still trying to reclaim his father’s glory. Saif Al-Islam Gadhafi, the London-educated son who was to succeed his father and carry on the dynasty is possibly still at large. Libya’s interim government had said he was captured this weekend, but at the very same time the 39-year-old appeared on Syrian television. The short message was broadcast on Syrian TV station Al-Rai on Sunday and was soon uploaded by several users onto YouTube. It’s not clear if the audio-only message was broadcast live or was a recording. The Al-Rai station broadcasts into Libya, and in the past has broadcast messages from Moammar Gadhafi. “These barbaric executions and the grotesque abuse of the corpses make it clear that no person affiliated with the former regime will receive a fair trial in Libya,” he said through his publicist. Libya’s acting Prime Minister Mahmoud Jibril said that he would not oppose a full investigation under international supervision into his death, according to The Associated Press. 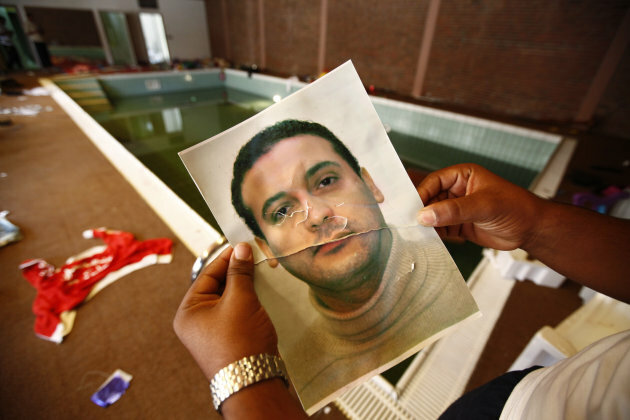 The fate of one of Gadhafi’s other sons, Moutassim Gadhafi, is quite clear however: his body now lies with his father’s on display in a meat refrigerator for all of Libya to see. “This is his destiny because of all the evil he has done,” one Libyan spectator said after lining up to see for himself the body of the man who ruled Libya for 42 years and his fifth son. All of the dictator’s eight children lived their lives as lavishly and as ruthlessly as their father. 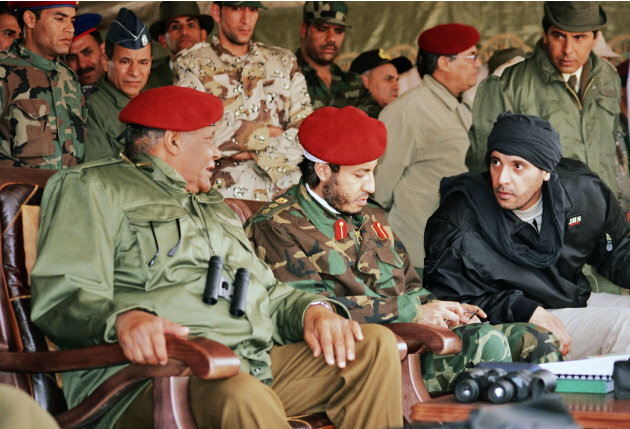 Three of the Gadhafi children — Moutassim, Khamis and Said al-Arab — have been killed in the revolution. 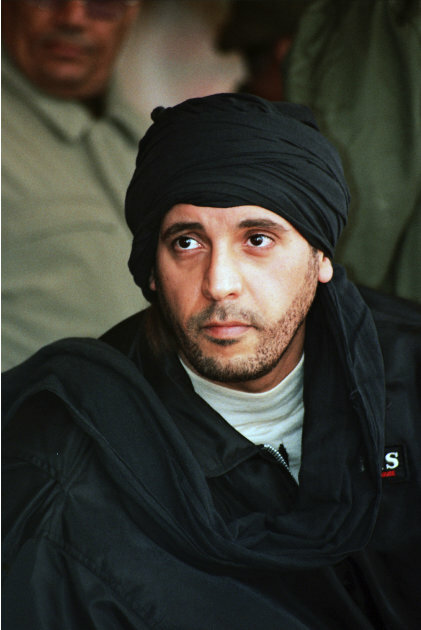 Three more, Hannibal, Mohammed and Gadhafi’s only daughter Aisha – once called the Claudia Schiffer of North Africa — are now living in exile in Algeria with Gadhafi’s wife Safia. 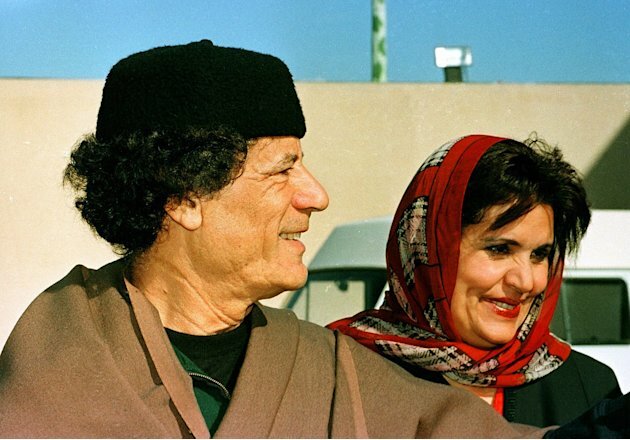 Across Libya there is little sympathy for anyone in the Gadhafi family. The interim government officially declared the country liberated this weekend, and has promised to bring democracy. While celebratory gunshots rang out across the capital of Tripoli, it has been one non-stop party as Libya begins its transition to democracy. A new interim government is expected to be declared within a month, with elections for a constitutional assembly expected within eight months. 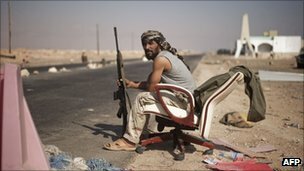 National Transitional Council fighters fire against pro-Gaddafi fighters on October 6, 2011, in Sirte. 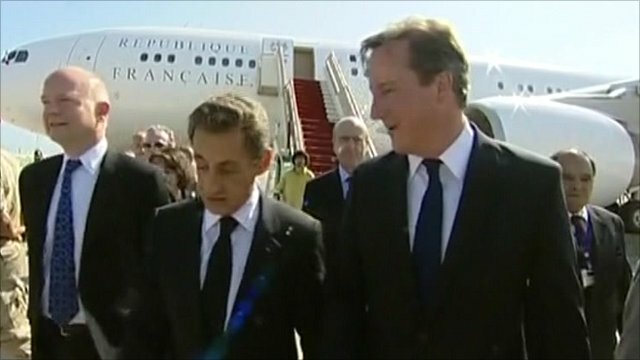 British PM David Cameron and French President Nicolas Sarkozy are in Libya, the most senior Western leaders to visit since Muammar Gaddafi was ousted. Their countries were at the forefront of Nato’s Libyan operation. They met National Transitional Council (NTC) leaders in Tripoli, and are to fly to Benghazi to speak in the former rebel stronghold’s Liberty Square. NTC chief Mustafa Abdul Jalil thanked the two leaders for taking “brave positions” during the Libyan uprising. “They showed us political, economic and military support which helped the rebels establish a state, and we thank France and the UK for that,” he told a Tripoli news conference. On Wednesday, Mr Abdul Jalil had appealed for weapons to help the NTC take the few areas of Libya still loyal to Col Gaddafi, telling the BBC the fugitive leader was in the country’s south, plotting his revenge. Responding to Mr Jalil’s welcome, the British and French leaders praised the bravery of the Libyan people, and pledged continued support for the NTC’s goal of creating a peaceful and democratic state. “The fact that roads are full of traffic, your water is flowing, your hospitals are working, this is impressive,” said Mr Cameron. 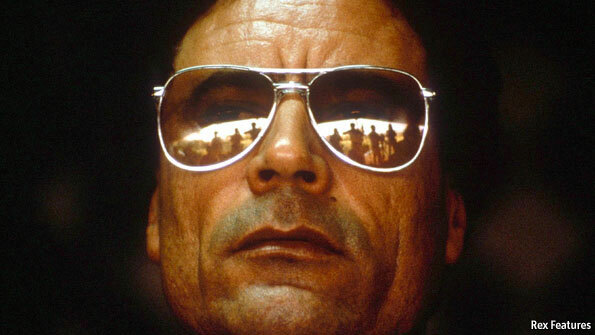 “But… Gaddafi is still at large. We must keep on with the Nato mission until civilians are all protected and this work is finished. Mr Sarkozy urged Libyans to avoid “vengeance and retaliation”, calling on them to preserve unity and seek reconciliation. He said France’s focus was on consolidating the position of the NTC and pursuing the last remnants of the Gaddafi regime, rather than focusing on economic deals or reconstruction contracts. As many as 750,000 people could die as Somalia’s drought worsens in the coming months, the UN has warned, declaring a famine in a new area. The UN says tens of thousands of people have died after what is said to be East Africa’s worst drought for 60 years. 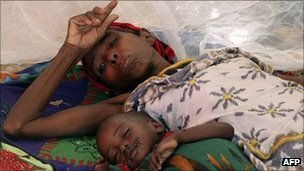 Bay becomes the sixth area to be officially declared a famine zone – mostly in parts of southern Somalia controlled by the Islamist al-Shabab. Some 12 million people across the region need food aid, the UN says. The situation in the Bay region was worse than anything previously recorded, said senior UN’s technical adviser Grainne Moloney. “The rate of malnutrition [among children] in Bay region is 58%. This is a record rate of acute malnutrition,” she told journalists in the Kenyan capital, Nairobi. This is almost double the rate at which a famine is declared. Wednesday, 31 August 2011, 11:48 am Press Release: UN News New York, Aug 30 2011 12:10PM The United Nations refugee agency today said it will airlift 240 tons of aid from Saudi Arabia to Somalia during the Eid al-Fitr holiday to ensure that those facing the severe food crisis in the Horn of Africa country have enough to eat during the special occasion, which marks the end of the Islamic fasting month of Ramadan. The aid is in the form of special Eid packages, including of ready-to-eat meals, orange juice, sweets and biscuits, Adrian Edwards, the spokesperson of the UN High Commissioner for Refugee (UNHCR), told reporters in Geneva. The assistance will be distributed to internally displaced persons (IDPs) and among the urban poor in the Somali capital, Mogadishu, and the Lower Shabelle region. The UN High Commissioner for Refugees, António Guterres, is on a three-day visit to the Horn of Africa to show solidarity drought-affected Somalis during Eid al-Fitr. UNHCR’s goal is to provide as much aid as possible within Somalia so that people affected by famine and conflict there are not forced to make the arduous journey to neighbouring countries in search of assistance, Mr. Edwards said. He said that the influx of Somalis into Ethiopia and Kenya had slowed, but refugee camps in the two countries continue to face challenges. In Ethiopia’s Dollo Ado area, the Kobe camp has seen a slight decrease in the overall mortality rate – from 5.7 deaths per 10,000 people a day last week to 4.9 per 10,000 this week – but deaths among children under the age of five have been on the rise. 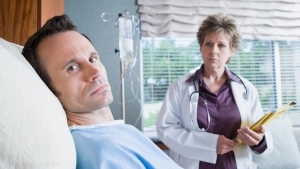 The mortality rate in that age group has gone up from 12.9 per 10,000 per day last week to 15.3 per 10,000 this week. Measles remains the main cause of death in Kobe camp, accounting for 68 per cent of the fatalities. Other causes of death are severe malnutrition, pneumonia and diarrhoea. Although health services and nutritional feeding programmes are available, some parents are failing to take their children for continuing treatment, Mr. Edwards pointed out, a factor that has necessitated the decentralization of services. In addition to the community outreach programme, a mobile health clinic run by the UN Children’s Fund (UNICEF) will this week start work in Kobe camp to encourage refugees to use the medical facilities available. In the Dadaab refugee complex in Kenya, some 30,000 recent arrivals have so far been moved from areas outside the Ifo Extension and Kambioos camps. “We continue to pitch new rows of tents, and focus on the immediate provision of basic hygiene services, namely by installing water systems and digging latrine pits,” said Mr. Edwards. In a related development, UNHCR said it had received a $62 million donation from the IKEA Foundation to fund the emergency relief intervention in the Dadaab complex. The donation, to will be disbursed over a three-year period, is the largest ever received by the agency from a private donor, Mr. Edwards said. BBC’s Wyre Davies says the battle for the city is almost over, and for many that is cause for celebration as victorious rebel fighters arrive from the east, west and south. Most of the fighting in the capital appears to be over. The bigger problem here now is a humanitarian one. 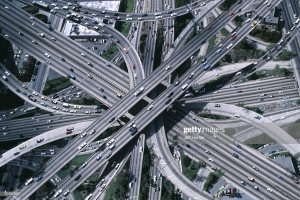 This is a city of two million people with no effective political direction or leadership. The real political leadership and the people who need to take control of the situation are not here and practically what that means is that when it comes to resources like water there is none, and there’s hardly any electricity – there was a blackout across Tripoli last night and only those hotels or buildings with generators had any power. There’s also a huge problem of public health – with no water or proper sanitation there’s a very difficult issue developing in many parts of the city. 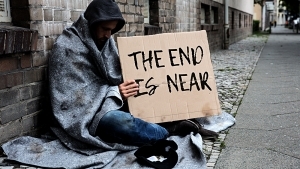 The biggest crisis now is a shortage of basic goods, our correspondent adds. There is no running water and hardly any electricity in a city of two million people. The supply of water, which usually comes from aquifers in the desert, has been disrupted by the fighting and restoring it will take some time. At the NTC’s first news conference in the capital since the uprising began six months ago, Mr Shammam said fuel was being distributed, and that water and medical supplies would be delivered by sea from Misrata. “We have 30,000 tonnes of gasoline. We’ll start to distribute it to the public starting today. 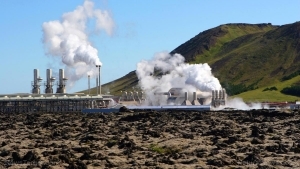 We have diesel fuel [which] will be arriving tomorrow, to support the electricity [power stations],” he said. Mr Shammam also called on all public, private and oil industry employees to return to work to help restore basic services to the capital. Dr Aref Ali Nayed, operations director for the NTC’s Libya Stabilisation Team, told the BBC from the Libya-Tunisia border that “multiple teams” were “working around the clock” to resolve the water shortages. Our correspondent says that most people will tolerate such shortages for now as the majority of people are happy to see the back of the brutal Gaddafi regime, even though the colonel himself has not been captured or killed. Earlier, the UK government said it was giving the International Committee of the Red Cross (ICRC) £3m ($4.9m) to provide surgical teams to treat 5,000 wounded people, and provide food for 690,000 forced to flee their homes. The International Organisation for Migration (IOM) meanwhile said it was desperate to reach sub-Saharan migrant workers caught up in the fighting. The head of the IOM in Benghazi, Martin Jerrett, told the BBC that Africans were facing deep hostility from the population of Tripoli because they were generally viewed as “mercenaries and/or close to the regime”. He said most were isolated and had no embassy representation. A ship carrying 260 evacuees has now arrived in Benghazi. In another development, at least 50 bodies have been found in a burned-out warehouse outside an abandoned military base south of Tripoli. Residents said they had been executed by members of a brigade commanded by Col Gaddafi’s son, Khamis, on Tuesday and Wednesday. “We heard gunfire before breaking the [Ramadan] fast and people shouting for help, but there were snipers outside and nobody could get close. These men were killed by Kalashknikovs and hand grenades, and then they were burned,” Dr Salim Rajub told the AFP news agency. On Friday, more than 200 decomposing bodies were found at an abandoned hospital in the capital’s Abu Salim district. Doctors and nurses fled because of the fighting and many injured patients were left to die. 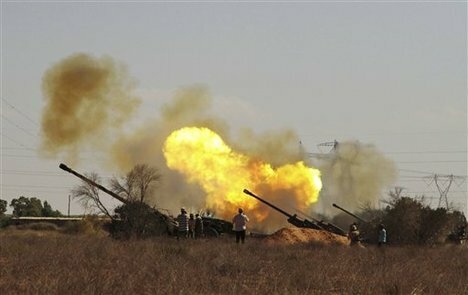 On the coast east of Tripoli, the rebel advance on Col Gaddafi’s hometown of Sirte is deadlocked. The BBC’s Paul Wood says there have been steady duels between the two sides, clouds of black smoke hanging over the main coastal road and the intermittent thump of shells or rockets exploding. Nato has been carrying out multiple airstrikes to try to restore the rebels’ momentum, hitting 21 targets overnight in and around Sirte, including armoured vehicles, gun emplacements, bunkers and a surface-to-air missile launcher. In the previous 24 hours, 29 targets were hit from the air, including a command-and-control facility, Nato said. Our correspondent says the rebels need to gain control of Sirte because without it, the country will effectively remain cut in two. The rebels remain as confident, even jubilant, as ever, convinced that they have the momentum as they approach what may be the final big battle of this war and their revolution, he adds. “There is intensive consultation and negotiation with the community leaders of Sirte,” Mr Shammam told reporters in Tripoli. Asked about the fate of Col Muammar Gaddafi, who some believe may be in Sirte, Mr Shammam said the fugitive leader would be caught. A senior NTC spokesman Shams al-Din Ben Ali separately told the BBC that it was possible that Col Gaddafi was still in the Tripoli area. If he had escaped the capital, it was likely that he would head for the Algerian border, rather than Sirte, because the Algeria was the last of Libya’s neighbours that might give him sanctuary, Mr Ben Ali said. It was possible that Col Gaddafi’s wife and daughter, as well as other senior regime officials, had already fled to Algeria, he added. Algeria’s foreign ministry has denied a report that a convoy of six cars under armed guard crossed its border on Friday morning. World powers are strategizing their next moves for relations with Libya. French envoys said Wednesday the country is working with its allies to draw up a United Nations resolution that would unfreeze Libyan assets. 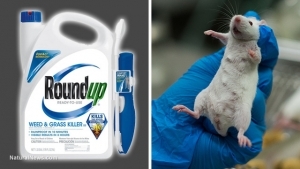 The assets were blocked by U.N. Security Council sanctions. British officials also said Wednesday they are exploring ways to help Tripoli, if leader Moammar Gadhafi no longer retains control. Nicaragua said it will consider offering asylum to Gadhafi. But an aide to President Daniel Ortega said Tuesday the Libyan leader has not requested the assistance. Also Tuesday, the Chinese government said it is asking the U.N. to lead post-conflict efforts in Libya. Foreign Minister Yang Jiechi urged U.N. Secretary-General Ban Ki-moon to play a leading role and work with other groups to restore order. China, which has billions of dollars in trade deals with Libya, initially adopted a policy of non-interference in Libya’s revolution and refused to follow the lead of other countries in recognizing the Libyan rebels as the country’s new government. Ban is expected to hold an urgent meeting this week on Libya with major organizations that include the African Union, European Union and Arab League. The African Union, which tried to mediate the Libyan conflict, has yet to recognize the rebels. AU heads of state are scheduled to hold a series of meetings in Ethiopia this week. Despite the Libyan rebels recent military gains, Venezuelan President Hugo Chavez declared Tuesday that he will continue to recognize Gadhafi as Libya’s legitimate ruler. He also reiterated his statements condemning the NATO airstrikes in the country and accusing Western countries of seeking to steal Libya’s resources. Already recognized as a humanitarian crisis, the ongoing drought in Somalia has now been officially classified as a “famine.” The United Nations made the annoucement Wednesday. Somali refugees arrive every day in the Dadaab Refugee Camp in eastern Kenya. The announcement came as no surprise. On Wednesday, the United Nations said that two regions in southern Somalia — Bakool and Lower Shabelle — are suffering from famine. Faced with the worst drought in 60 years, the UN estimates that some 350,000 people in the region are without food. The crisis began weeks ago, but this is the first time the UN has used the term “famine,” something it defined as “an extreme food crisis killing children but also adults” in a recent press release. The term is employed when malnutrition in adults and children reaches 20 to 40% and mortality rates are equal or superior to two deaths per 10,000 people per day. In Somalia that number is at 7.4. 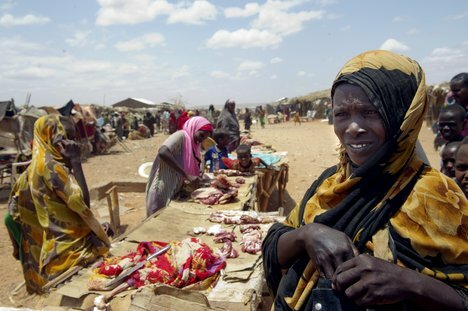 The UN Food and Agricultural Organization (FAO) implemented set standards to measure the IPC during the 2005 food crisis in Somalia, looking at the level of malnutrition, access to water and the country’s economic situation. Data is collected by NGOs and the UN. Still, the country concerned has the final say in the ranking. Even though in the case of Somalia, the UN made the announcement without consulting with the Somali government. In addition to rating the severity of a crisis, the IPC also allows gives a clear indication of how much international and humanitarian aid is needed. The FAO will meet in Rome on July 25 to convince member states to react quickly and supply additional food aid to Somalia. “It’s a matter of life and death,” says Weheleey Osman Haji, a day after giving birth near the Kenyan border town of Liboi. She and her five other children arrived in Kenya after trekking for several weeks from their homeland in Somalia, whose ongoing conflict has left it the country least able to cope with the Horn of Africa’s worst drought in 60 years. The 33 year old has named her new baby Iisha, which loosely translates as “life”. Deep asleep in his mother’s arms during the BBC interview, he was unaware of the circumstances under which he came into this world. The one day old was born under an acacia tree 80km (50 miles) north of Kenya’s Dadaab refugee camp, where thousands of Somalis are heading every day after arduous journeys. They cross the border expecting immediate respite, but many of the refugees are unaware of the long distance they still have to go to reach Dadaab. 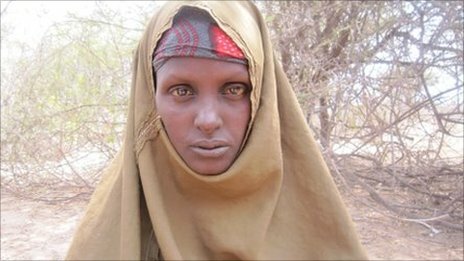 “There was drought; We have been walking for 22 days drinking only water,” Mrs Haji says. “Since I delivered, I haven’t eaten a thing. Umsunduzi deputy mayor and the ANC’s Moses Mabhida regional treasurer Alpha Shelembe has bowed to pressure by resigning from both the municipality and the organisation. Shelembe announced his resignation yesterday, putting an end to weeks of revolts and protests by disgruntled members that resulted in the burning of party offices in Pietermaritzburg. An emotional Shelembe said yesterday: “All of you are aware that my name has been in the public domain and many people have been saying a lot of things about me. During this time, I remained quiet and decided not to speak or respond to anything to allow the ANC to deal with this matter openly and find the truth. He also denied having encouraged Themba Mbona to set the ANC offices in Pietermaritzburg alight, causing damages estimated at R750000. Michelle Obama and her daughters Malia Ann, 13, and Sasha, 10, clearly hadn’t expected the chilly weather that greeted them as they arrived at the Waterkloof Air Force Base in Pretoria last night. The wife of US President Barack Obama led a big touring party that included her mother, Marian Robinson, and two nieces and a nephew who followed closely behind as cameras flashed incessantly at the now iconic US First Lady. Obama is on a six-day visit to the region and it is expected that she will focus on young women leaders and the legacy of the anti-apartheid struggle during her trip. Dressed in smart black pants and a close-fitting black and red patterned top, Obama quickly shook hands with officials, including Minister of Correctional Services Nosiviwe Mapisa-Nqakula. JOHANNESBURG (AP) — Michelle Obama on Wednesday told young African leaders, including members of South Africa’s post-apartheid generation, that there are more causes worth fighting for and more history to be made. She urged them to be the ones who end hunger, wipe out HIV/AIDS and protect women’s rights. In an emotionally stirring speech at a church that became a popular refuge during the fight against government-imposed segregation in South Africa, America’s first lady drew on the struggle for racial equality in the U.S. and in this country as she sought to inspire young people to become the next generation of problem-solvers. “I know that as your generation looks back on that struggle and on the many liberation movements of the past century, you may think that all the great moral struggles have already been won,” Mrs. Obama said in a keynote address to a U.S.-sponsored leadership conference for more than 70 young African women. “But while today’s challenges might not always inspire the lofty rhetoric and high drama of struggles past, the injustices at hand are no less glaring. The human suffering is no less acute. “So make no mistake about it: There are still so many causes worth sacrificing for. There is still so much history yet to be made,” she said. Sixty percent of Africa’s population is under age 25 and two-thirds of South Africans are younger than 30, Mrs. Obama said. The first lady said this generation can be the one that brings prosperity to forgotten corners of the world, banishes hunger from Africa and ends HIV/AIDS and the stigma associated with it. She said they can ensure that women are no longer treated as second-class citizens, that girls get an education and that any type of violence against women is seen as a violation of human rights. “That is the history that your generation can make,” Mrs. Obama said. First lady Michelle Obama participates in a breakout session at the Young African Youth Leaders Forum in Johannesburg, South Africa, Wednesday, June 22, 2011. A Pablo Picasso painting given to the University of Sydney by an anonymous American donor has sold at a London auction for 13.5 million pounds ($22 million). I and my pals were looking at the best solutions found on your website and so the sudden developed an awful suspicion I had not expressed respect to the site owner for them. All of the boys appeared to be as a consequence glad to read through all of them and already have surely been enjoying those things. I appreciate you for simply being really kind and for settling on this kind of important resources most people are really desirous to be aware of. Our own sincere regret for not saying thanks to you sooner. Whoah ! This blog is magnificent, I love studying your articles. Keep up the great paintings! 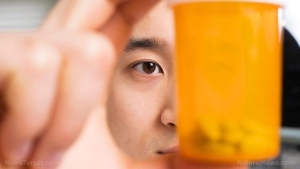 You recognize, many individuals are hunting round for this information, you help them greatly.